[Philip Larkin, poet.] Typed Letter Signed ('P. 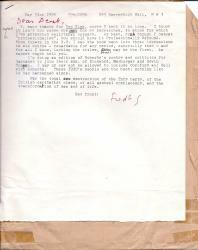 A. Larkin') to Michael Dawson, offering to bear in mind his invitation to produce a poem for the Ilkley Festival. On his letterhead as Librarian, The University of Hull. 13 September 1972. 1p., 8vo. In fair condition, lightly aged and creased. He begins by thanking him for his letter 'about the possibility of a poem in connection with your Ilkley Festival next Easter'. He doubts whether, even if he promised to do so, he would be 'able to produce anything', but asks to be informed of the deadline, so that he can 'keep the suggestion in mind in case any idea turns up that could be bent to your purpose'. 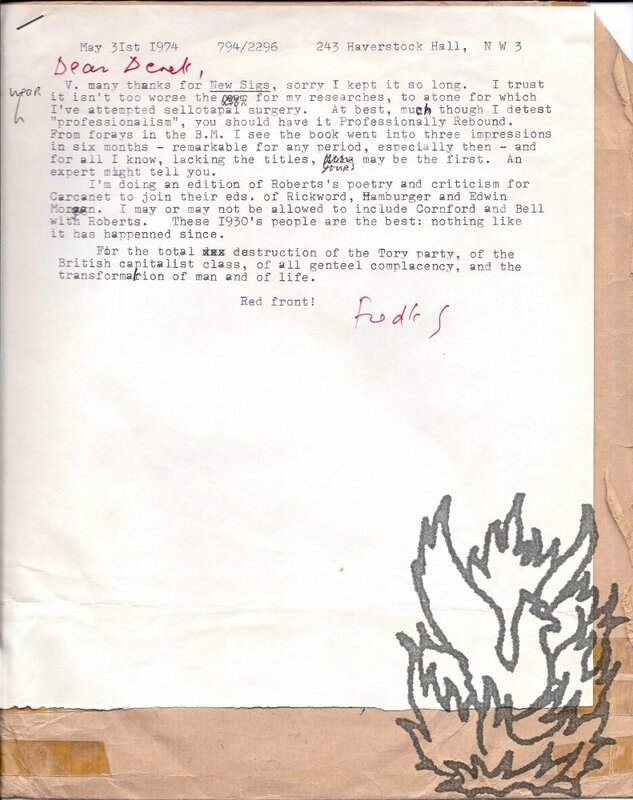 Four Typed Letters Signed and two Autograph Cards Signed from the Hampstead poet Frederick Grubb (one in full, four 'Fredk G' and one 'Comrade G') to the critic Derek Stanford, including a virulent attack, and with two other items signed by Grubb. 1973 and 1974; most from 243 Haverstock Hill, Hampstead. All items clear and complete, on aged paper. Letters totaling: 4to, 1 p; landscape 8vo, 5 pp. The two cards carry long messages, written in red ink in Grubb's close, neat hand; one is standard size, the other 27 x 13.5 cm. Five envelopes are stapled to their letters. Grubb ('one of the last survivors of the famous 1960s Hampstead coterie of writers, actors and critics') writes entertainingly in an emphatic, energetic manner marvellously evocative of the 1970s London literary scene.